My day always needs a good cup of tea. After dropping the kids at school I love to sit and enjoy my tea. If for some reason I don't have it, I feel like something is missing the whole day. My go to tea has always been Orange Pekoe. I prefer homemade tea over buying or ordering in a restaurant. I always find, when having tea outside, it is never strong enough or hot enough. At home, I'm able to get a piping hot cup of strong tea. When I first starting to drink tea I was in my teens and needed a lot of sugar and a lot of milk. As I've gotten older, the amount of sugar and milk has gone down so I can taste more of the tea. 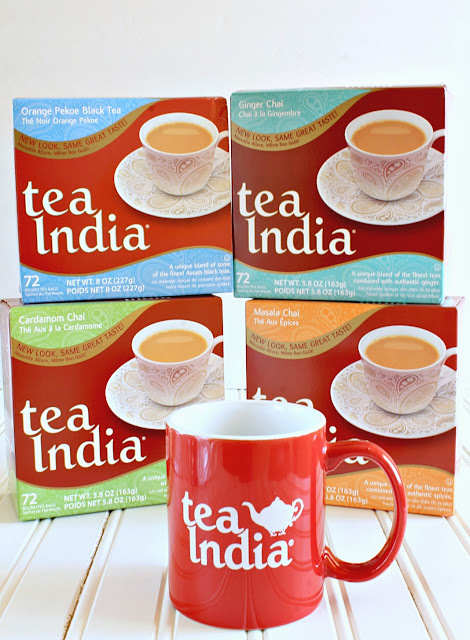 Recently, Tea India sent me a selection of their teas. They were perfect for making a cup of kadak chai! By far, our favourite was the Cardamom Chai. It has the perfect amount of Cardamom. The best way to enjoy this tea is to start by boiling some milk and steeping the tea bag in the hot milk. It takes some time, but the results are worth it! For best flavour, use whole milk. For me a simple cup of piping hot tea is fine but my husband loves to have a little snack along with tea. 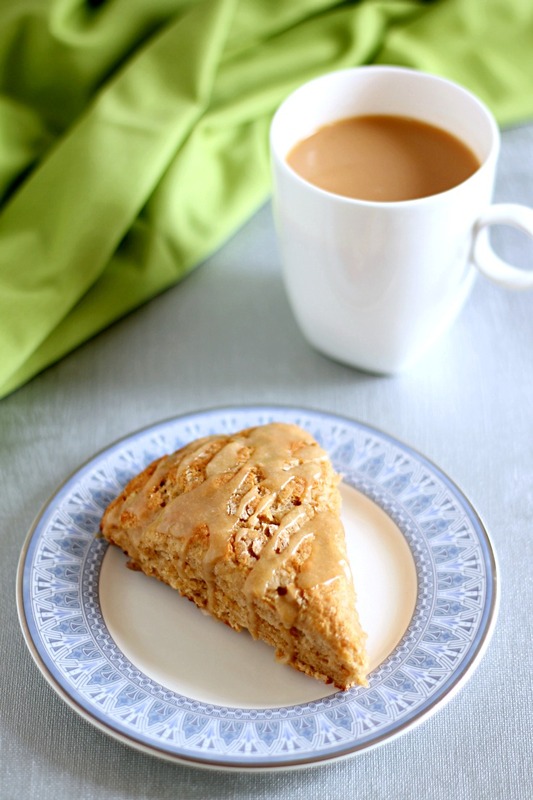 Today I am sharing a recipe for Banana Scones that is the perfect accompaniment to a cup of tea. These scones are best served the same day. The scone itself is not very sweet so be sure not to skip the Brown Sugar Glaze. You can drizzle just a little on top or spoon it over to cover completely, all depending how sweet you would like your scone. Mash bananas and add enough milk to make 1 cup. Add yogurt and mix. In a large bowl, whisk together flour, sugar, baking powder, salt and cinnamon. Cut in the cold butter using a pastry cutter, fork or your hands until butter pieces are no bigger than the size of peas. Add the banana mixture and stir until just combined. Line a plate with wax paper. Turn out the dough and pat into an circle that is one inch thick. Place another piece of wax paper on top and freeze for 30 minutes. Preheat oven to 400 F. Line a baking sheet with parchment paper. Peel off the top layer of wax paper and invert the scones onto the baking sheet. Cut into 8 triangles and gently pull apart to allow room for the scones to expand. Bake 25-30 minutes or until they are firm and turning golden brown on the edges. Cool completely. To make the glaze, pour the milk and butter in a microwaveable bowl (I used my glass measuring cup) and microwave for 30 seconds. Add the brown sugar and vanilla. Mix until the sugar is dissolved. It does not dissolve, put in the microwave again for approximately 30 seconds. Whisk in the icing sugar starting with 1/4 cup. Add more depending on the thickness you would like. You can drizzle over the scones or spoon on. Enjoy with a piping hot cup of tea! This post is part of a sponsored campaign on behalf of the South Asian Bloggers Network for Tea India and I have received compensation for this post. All opinions are my own. ooh these look delicious! I love a good scone and will try this one for sure!